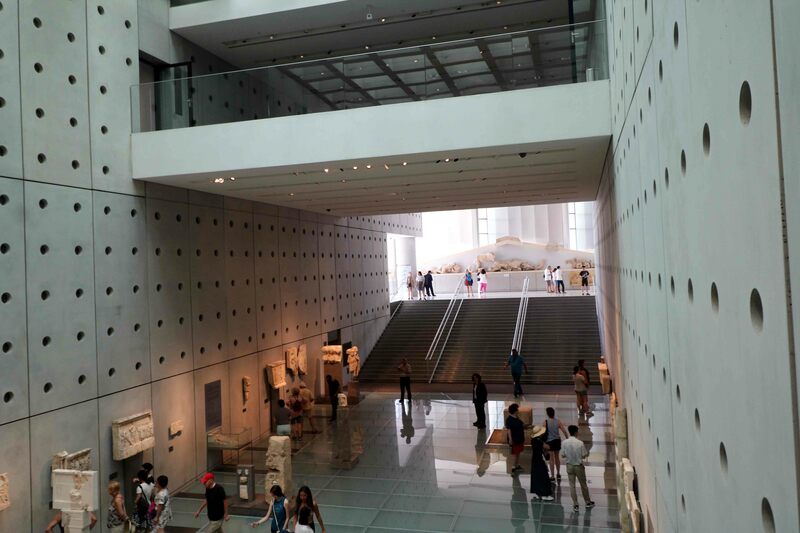 On June 10, we set out to visit the Acropolis Museum. 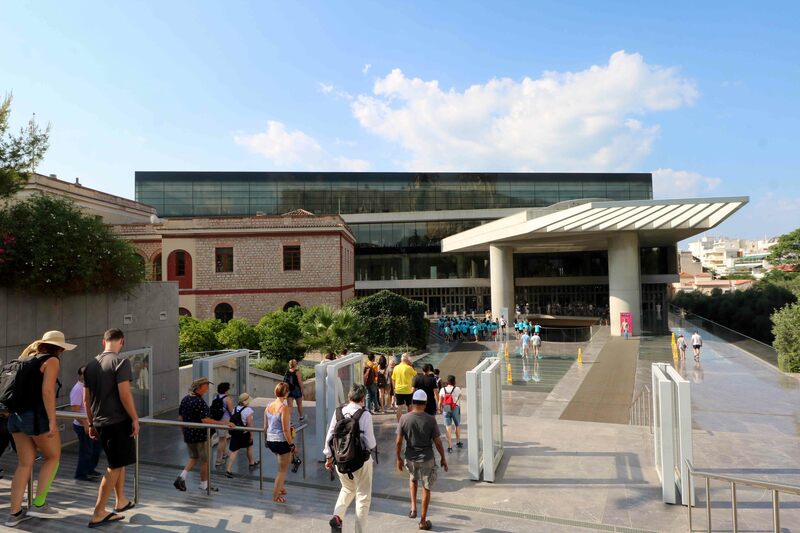 Voted one of the best museums in the world, with a total area of 25,000 square meter, the museum showcases Greek history through its three floors. The museum was inaugurated in the summer of 2009. The Museum is built above a large urban settlement on the Makriyianni site dating from Archaic to Early Christian Athens. This discovery is being integrated into the Museum and is yet to open to public. 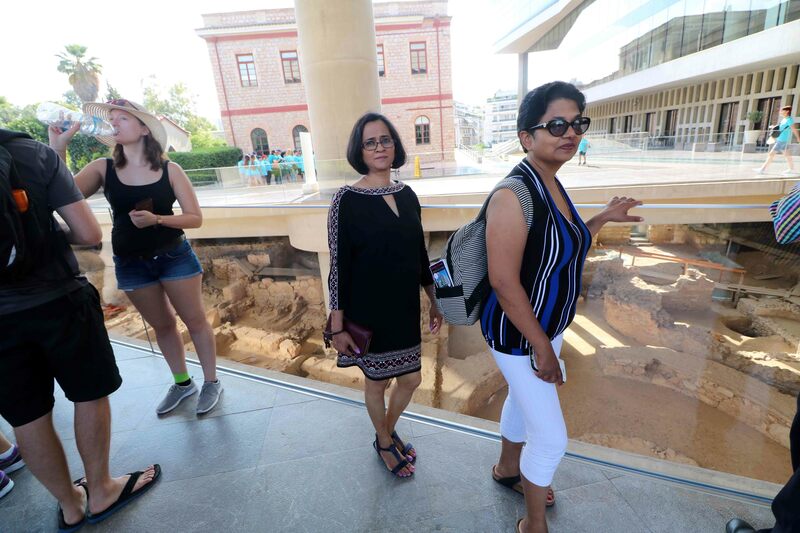 As we walked on the glass floor, we could see excavation and restoration process of the Makriyianni site. On the ground floor, the ‘Gallery of the Slopes of the Acropolis’ houses exhibits from the sanctuaries that were established on the slopes of the Acropolis, as well as objects that Athenians used in everyday life from all historic periods. 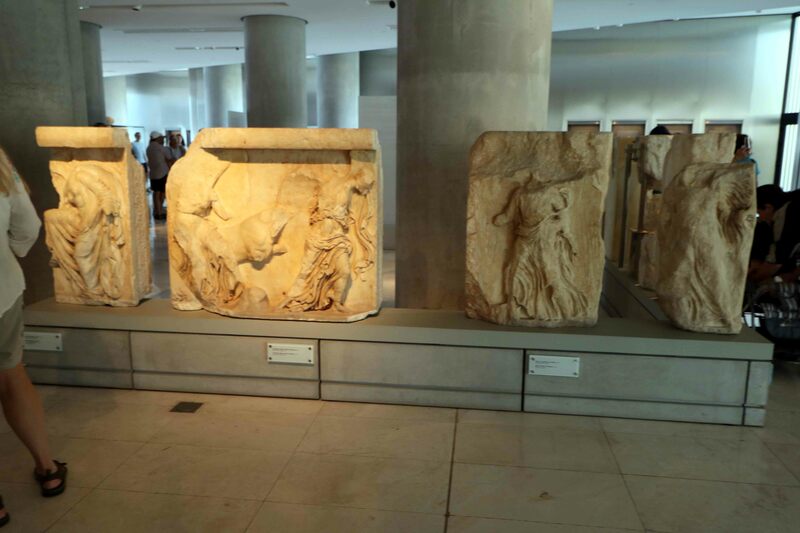 ‘Archaic Gallery’, on the first floor, hosts the magnificent sculptures that graced the first temples on the Acropolis. Photography is not permitted in these two floors. Third floor, ‘Parthenon Gallery’, where sculptures of the Parthenon period are exhibited in continuous sequence along the perimeter. The most impressive among the exhibits is the Caryatids. A Caryatid is s a sculpted female statue, used as a column or a pillar, supporting the structure on her head. This Greek term literally means ‘maidens of Karyai.’ These original statues once supported the roof of the North porch of Erectheion. 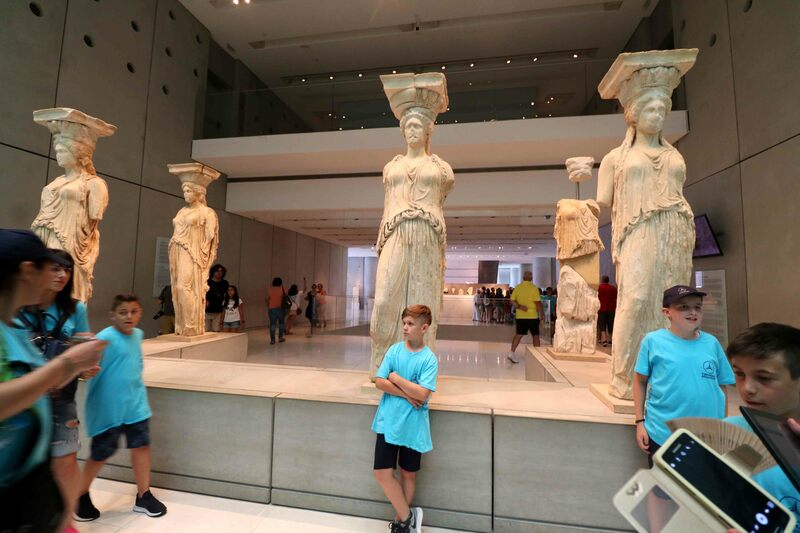 Five statues of Caryatids are in the museum. Statue on right-rear was smashed by a Turkish canon-ball in 1687, when the Parthenon was shelled during a battle between the Turks and the Venetians. The sixth is installed at the British Museum in London, which acquired it nearly two centuries ago after Lord Elgin, the British ambassador to the Ottoman Empire. He had it sawed off the Erechtheion’s porch, along with shiploads of adornments from the Parthenon to decorate his mansion in Scotland before selling the pieces to pay debts. Cast reproductions of six Caryatids now support the porch of Erectheion. 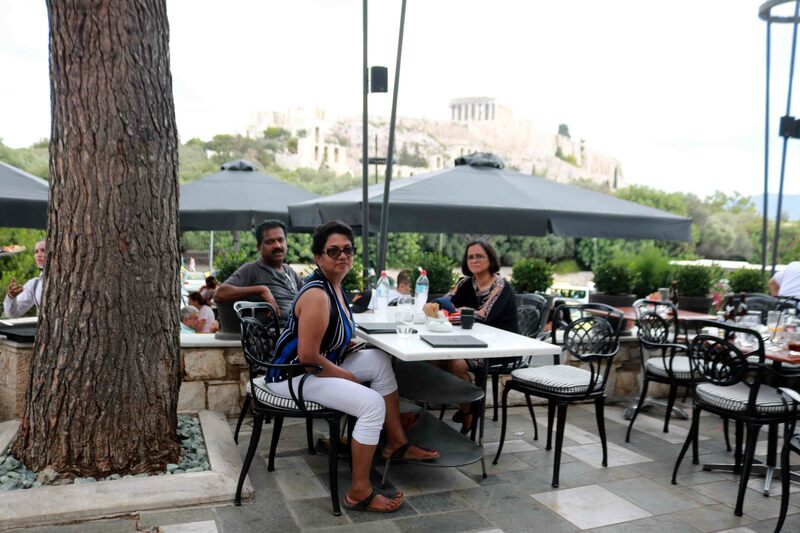 After spending about three hours at the museum, we walked to the iconic Acropolis. An `acropolis’ is any citadel or complex built on a high hill. The name derives from the Greek language meaning ‘High City’ or ‘City on the Edge’ or ‘City in the Air. 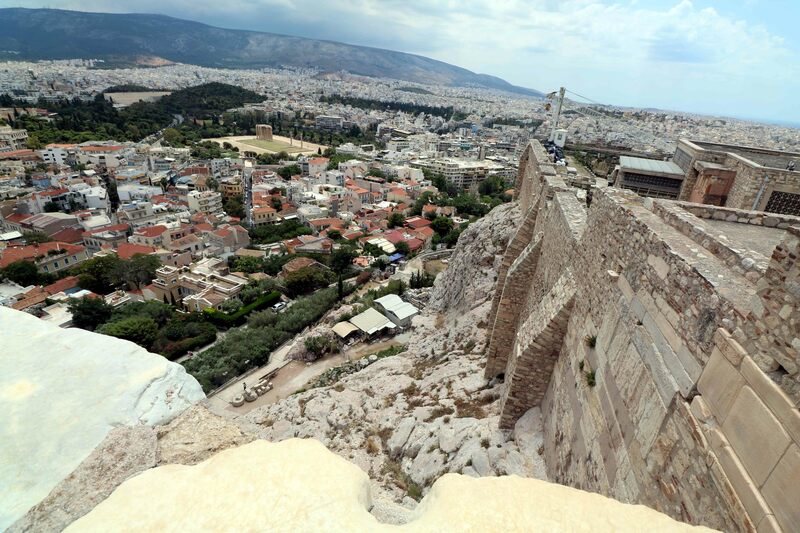 Most famous being the Acropolis of Athens, built in the Fifth century BC. 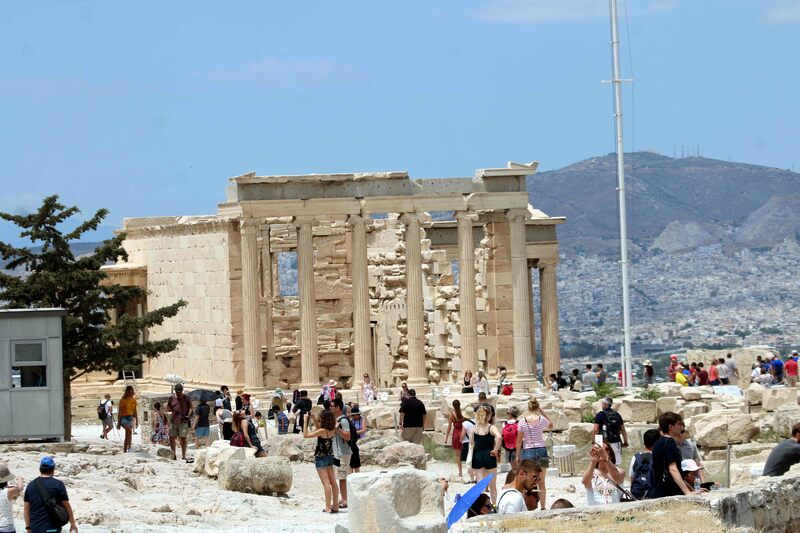 Acropolis is the most characteristic monument of the ancient Greek civilisation. It symbolises democracy and the beginning of Western civilisation and stands as an icon of European culture. More than half of the sculptures and artifacts from the Acropolis are in the British Museum in London and their return to Greece is a cultural and a political issue between the two nations, yet to be resolved. The Brits claim that Lord Elgin saved the marbles from destruction, and acquired them fairly. 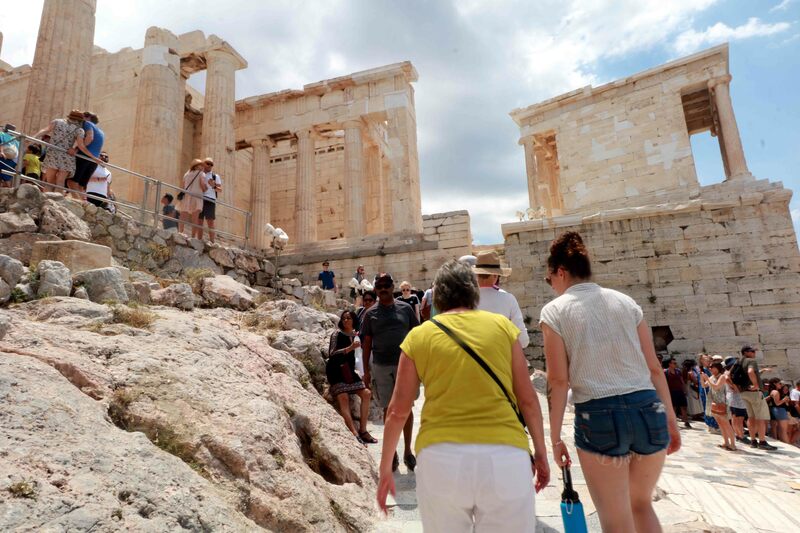 As we walked up the hill, we come across the Propylaea, meaning a monumental gate or entrance to a specific space, usually to a temple or religious complex. As we climbed up the Propylaea, on the Southern flank stands the Temple of Athena Nike. It was a place of worship for deities associated with wars, ‘Nike’ Gods or Goddesses. The Nike statute had no wings, as it was customary for Nike statues of the time, the temple acquired the name Apteros Nike (wing-less victory). 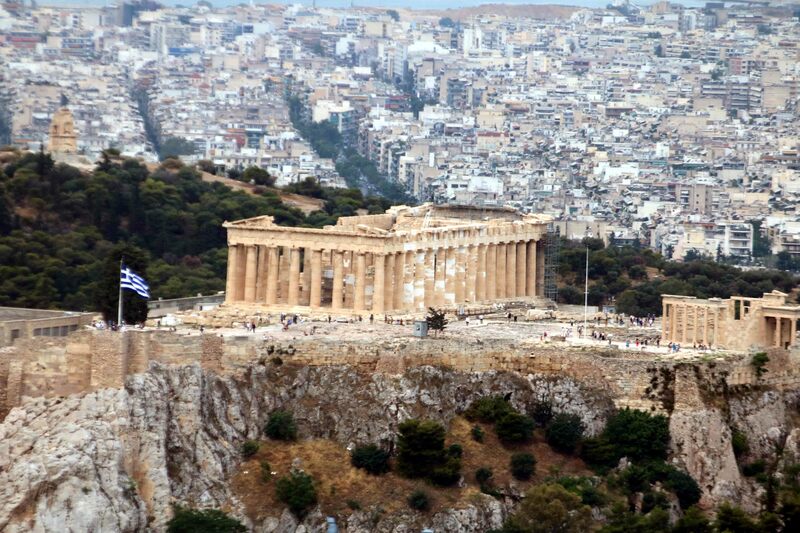 It is said that the statue was deprived of wings so it could never leave the city of Athens. Propylaea stands as an impressive building that surrounds the natural entrance to the plateau. After walking for about five minutes on the plateau, we were at the Parthenon. 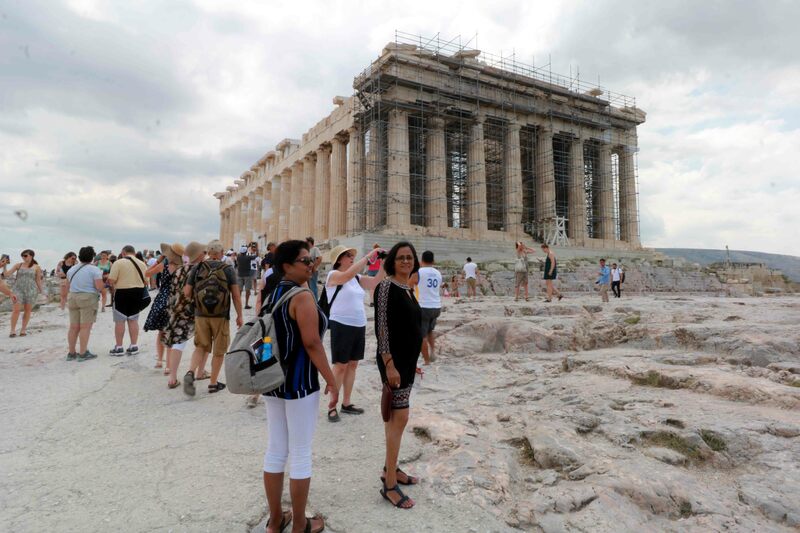 The Parthenon is a former temple dedicated to Goddess Athena, considered the patron Goddess of Athens. Construction began in 447 BC and was completed in 438 BC, although decoration of the building continued until 432 BC. It is the most important surviving building of Classical Greece. The temple was built to shelter the monumental statue of Athena that was made of gold and ivory. 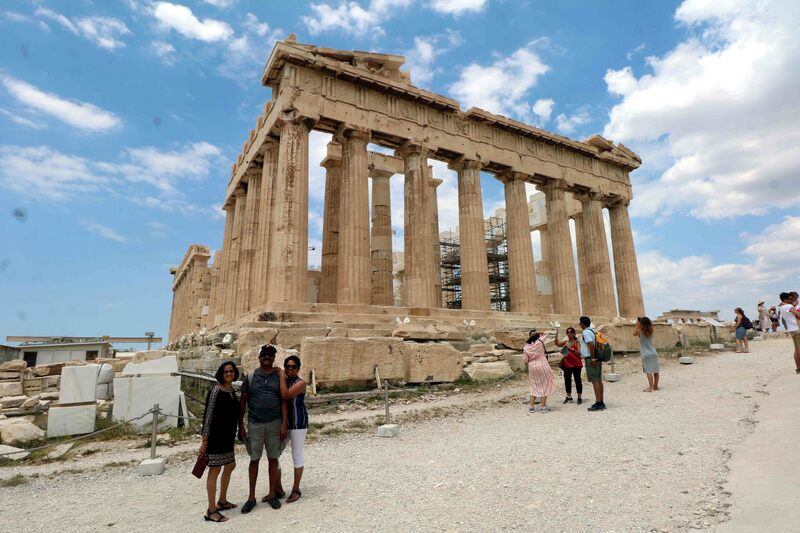 In 1975, the Greek government began a concerted effort to restore the Parthenon and other Acropolis structures and these efforts are still ongoing. 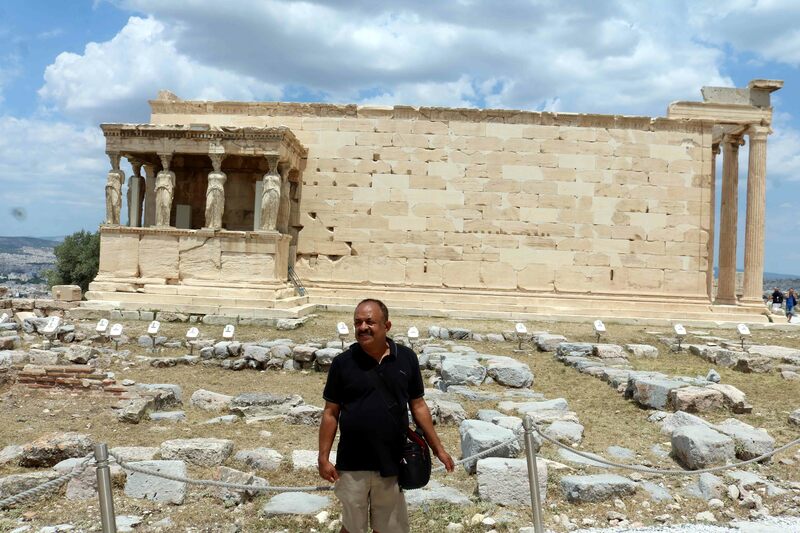 Walking around the Parthenon, we came to the Erechtheion. This temple was built to house the religious artifacts that the old temple housed. Construction of the Erechtheion began in 420BC. It is an intricate temple designed to accommodate the uneven ground on which it stands. 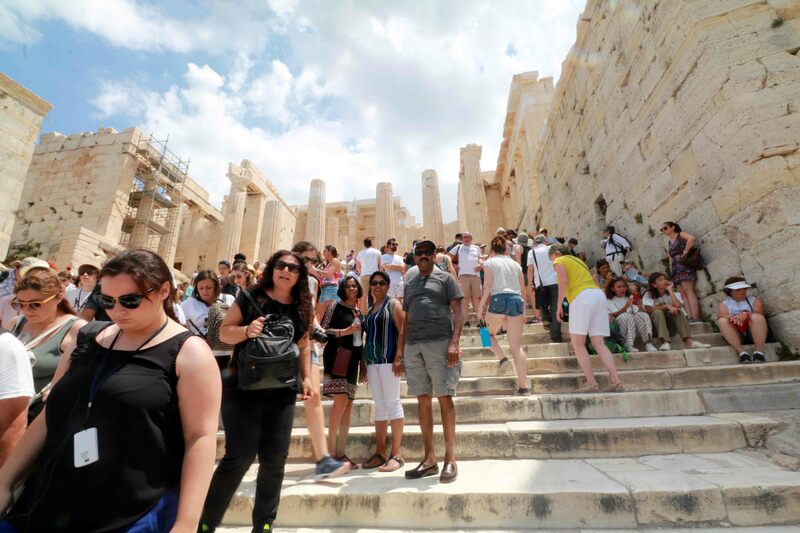 The need was to build a temple without disturbing sacred shrines like the altars to Poseidon and Hephaestus, and the spot where Poseidon is believed to have hit the Acropolis with his trident. Other shrines that needed to be accommodated included the sacred olive tree, a well containing sea water and the tomb of Kekrops. The temple faces East and its entrance is lined with six long Ionic columns. To the North and West, the wall of the temple drops dramatically to almost twice the altitude of the front and South sides. The temple is unusual in that it incorporates two porches; one at the North-West corner which is supported by tall Ionic columns, and one at the South-West corner which is supported by six massive female statues, the famous Caryatids. 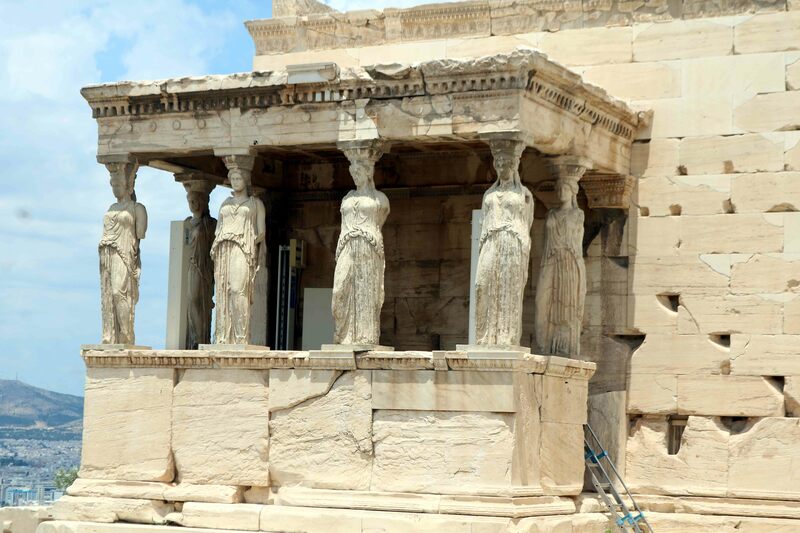 The Caryatids (replica as the original is in the museum) have become the temple’s signature feature, as they stand and seem to casually support the weight of the porch roof on their heads. 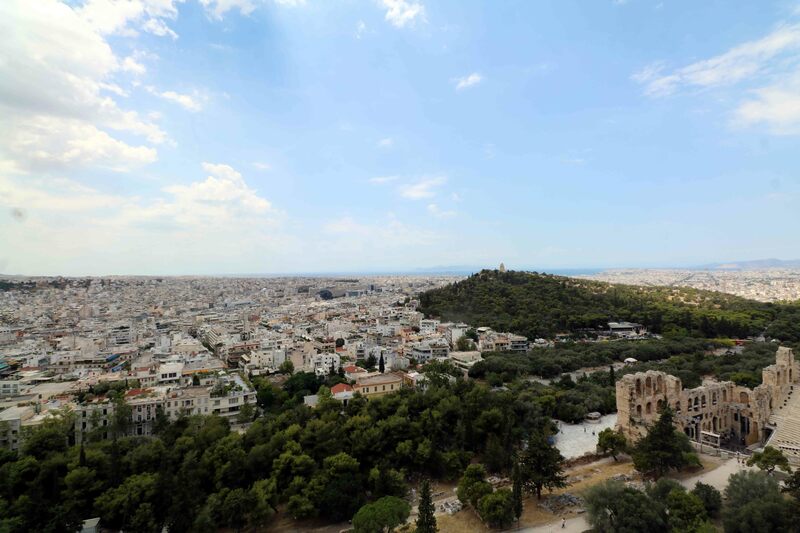 Acropolis also provides an excellent view of Athens and some important historical monuments adjacent to it. 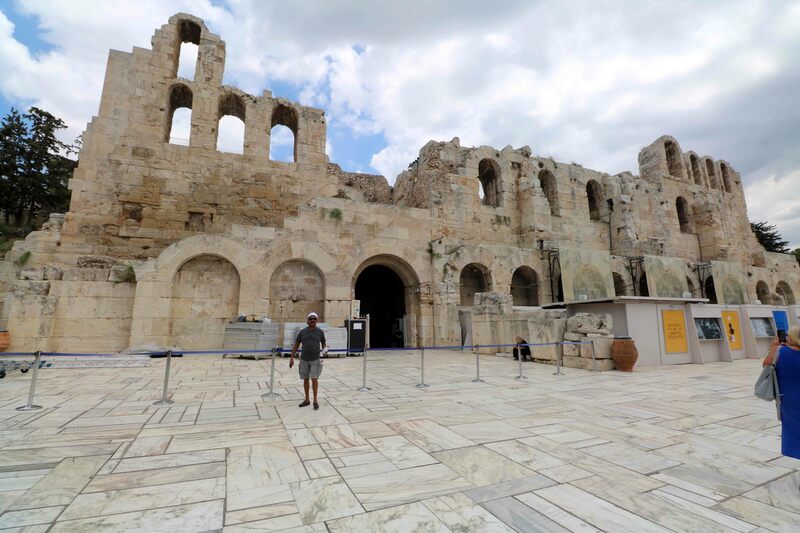 The Odeon of Herodes Atticus, built at the base of the Acropolis is an ancient amphitheatre. This ancient theater, with a capacity of about 5,000, was built in the Roman times, about 161 AD. by the Roman philosopher, teacher and politician Herodes Atticus in memory of his wife Aspasia Regilla. It was destroyed in 267 AD and was in ruins until restored in the 1950s. Since then it has been the main venue of the Athens Festival, which runs from May through October each year. Many world renowned musicians have held concerts here and was the venue for the Miss Universe 1973 pageant. 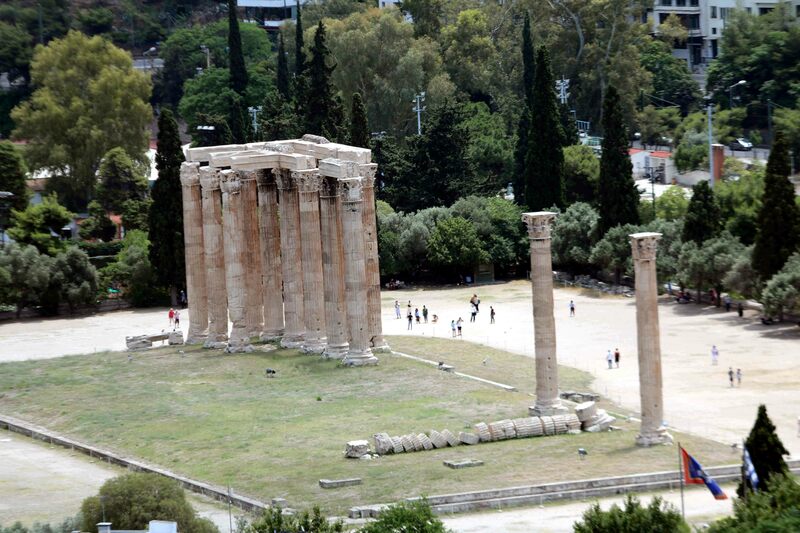 Temple of Olympian Zeus in Athens, also known as the Olympieion, is located on the South-East of Acropolis. It was built over several centuries starting in 174 BC and completed by Roman emperor Hadrian in 131 AD. Its unusually tall columns and ambitious layout made the temple one of the largest ever built in the ancient world. The Theatre of Dionysus Eleuthereus is considered to be the world’s first theatre, built at the foot of the Acropolis, cut into its southern cliff. 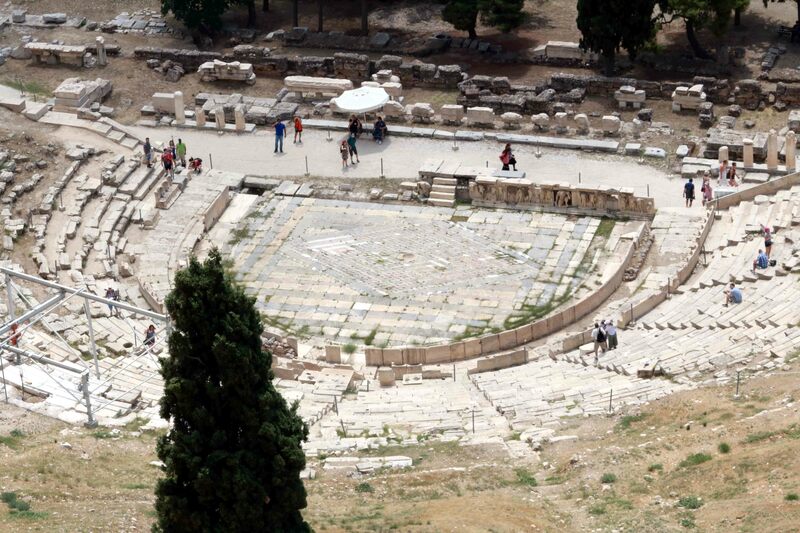 Dedicated to Dionysus, the God of plays and wine, the theatre could seat 17,000 people. It was the location for ancient Athens’ biggest theatrical celebration, the Dionysia. It was an engineering marvel with perfect proportion of depth/circumference. 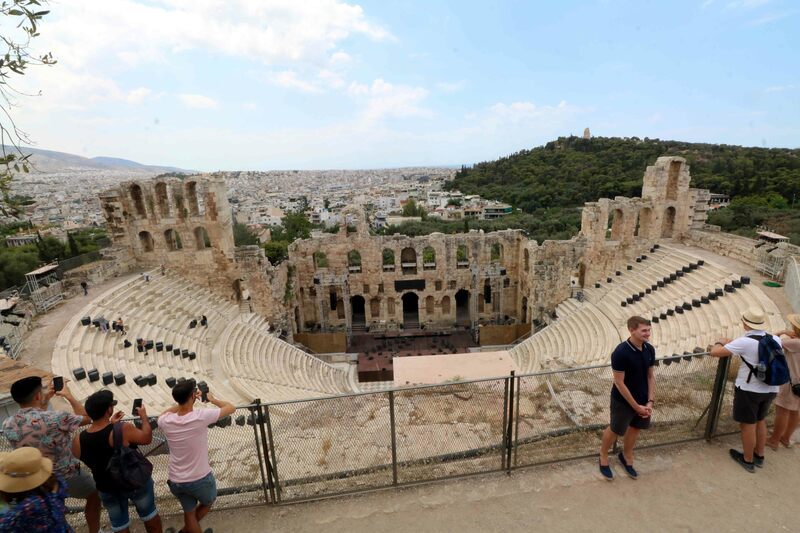 Here is where the great masterpieces by Aeschylus and Sophocles were first performed. I tried to imagine the great Greek tragedies being enacted with 17000 spectators, seated all around. The thought quietly transported me into a bygone era. So time for first impressions. Great food, great people and an immense sense of history in every nook and cranny, all together a great getaway.